A new rewarding scheme has been announced by the Income Tax department. 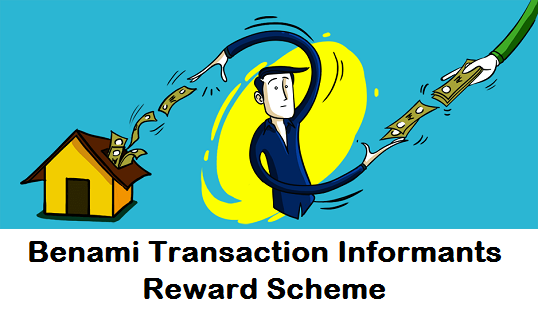 The scheme termed as “New Benami Transactions Informants Reward Scheme” has been announced for implementation from 2018 onwards. Under the new scheme, the Income tax department will reward all candidates who inform the department about the Benami properties within the country. As per the norms the informer will be rewarded by Rs 1 crore for passing out the information to the IT department. The new scheme for implementation has been announced by the Income Tax department of the country. The scheme will be implemented for fiscal year 2018 across the country for tracking black money transaction. Beneficiaries can claim for reward money of Rs one crore for sharing information related to benami property or transactions within the country. The government has also announced a reward of Rs 5 crore for sharing information related to transactions done outside the country in Black money. Under the new scheme the government has announced a reward of Rs 50 lakh to be given to the beneficiary for disclosing information related to tax evasion or assets within the country. This will be offered under IT act of 1961. The new scheme has been launched by the government on account of increasing number of transactions being made by people for purchasing benami properties using black money by their relatives or friends name. Under the new amendments such properties that are used for generating revenue without paying the tax amount will be easier to track. The new scheme has been launched so the citizens of the country can help the IT department track such Benami properties and transactions and necessary action be taken at the right time by the department and authorities. The cash reward will be given away by the department only after the transaction has been identified to be valid. Under the new scheme the department has also stated that it shall not disclose the name or identity of the informer. As per the government, all Residents of the country and non-resident Indians are free to participate in this new move to help the department tracking such cases. To report any such case, beneficiaries will have to visit the office of the Joint commissioner of IT (Income Tax) Department. You can visit the IT office department of Additional IT commissioner. You can also track the list of JCIT/ADDl. CIT office details at https://www.incometaxindia.gov.in/communications/notification/notification40_2017.pdf. At the office you will have to fill in the form in which all details related to Benami properties has to be filled in. on the same form you will have to provide with information related to details of the owner of the property. The copy of the form can be officially downloaded via the official website or from the Additional Commissioners or Joint Commissioners office (IT Department). After the details have been filled in the form the authorities will provide you with your valid “informant code”. This is to ensure that your detailed information including your name and given information are maintained with the department and will not be disclosed with others publicly. Foreigners can share information related to such properties abroad by contacting New Delhi Office at PIN 110001, North Block, CBDT. You can directly reach them via postal service or in person or even reach them via email id at Inv@incometax.gov.in. You will have to CC a copy of the form and information at citinv-cbd@nic.in or visit the ITOU Income Tax Overseas department. Interim Reward Details – The reward of 1 percent equivalent to the market value of the property will be offered in the initial stage when giving information. The reward money will be disbursed after four months of giving the information to the IT department. The money will be given by the IT department. Final Reward details – Once the validity of the information is scrutinized by the authorities, a reward of 5 percent of the property market value will be given to the informer by the department. The reward amount will be given to the informer after 6 months from the time of confiscation of the property by the authorities. The authorities have also stated that the informers will be given with a maximum reward amount of Rs 1 crore for sharing the information with the department. The government has also announced that the reward money will be given to the informer by the authorities via legal bank transfer in USD (Dollars) or INR (Rupees). No cash reward will be given to the beneficiaries. As per the authorities any person who has some right set of information that can be shared and is valid can be an informer. The rights for sharing information can be availed by Citizens of the country or Non-residents of the country who are staying abroad. The new scheme has been announced by the IT department so it can encourage more number of people to participate in the new drive to track such transactions and properties.